Anyone with sufficient experience (either within the Mountaineers, on their own, or with other programs) in scrambling, may use this course to obtain equivalency so you can participate in Mountaineer's led scrambles. If you have previous scrambling experience you may be able to join Mountaineers scrambles through our equivalency process. Off-trail travel: provide the scramble equivalency coordinator with a hiking resume that includes at least five unguided trips with at least 3000 feet of gain each and in which at least half of the gain was off-trail. Snow travel: demonstrate ice-axe self-arrest head first on stomach and on back, right-handed and left-handed to a qualified scrambling leader. 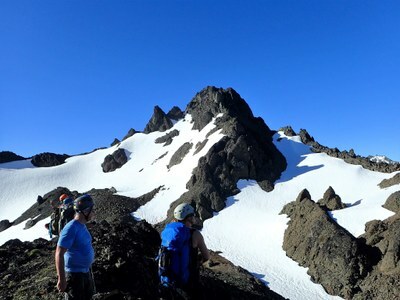 Prospective scramblers are urged to assist at the snow field trips to practice and refresh their skills, but the field trip cannot substitute for the test. Rock travel: demonstrate the ability to safely ascend, traverse, and down climb steep rock to a qualified scrambling leader including use of an improvised harness (e.g. diaper, hasty) and use it in a protected down climb using either a prussic or klemheist knot. Prospective scramblers are urged to assist at the rock field trip to practice and refresh their skills but the field trip cannot substitute for the test. Navigation: take the Navigation course, instruct at the Navigation workshop and field trip, or be granted Navigation equivalency by the Navigation committee. First Aid: take the Wilderness First Aid (WFA) course, the Mountaineering Oriented First Aid (MOFA) course, or be granted first aid equivalency (must have backcountry specific First Aid training). Process: A prospective scrambler seeking equivalency will contact the scramble equivalency coordinator (currently Richard Bell). The coordinator will review the application and work with you to schedule equivalency tests of rock and snow skills. After demonstrating the five individual areas of skills and earning the Low Impact Recreation skill badge (online training of approximately 20 minutes), the applicant will receive either a scramble badge or scramble student badge depending on prior experience. Both badges allow applicants to go on scrambles with the Mountaineers, but scramble students will then have until Nov 1 of the following year to complete three scrambles (at least one of which is rock and one of which is snow) and earn the scramble badge.